Attempting to take a bad 4WD road to a photographic destination, we found the way impassable due to mud and snow. We took a side road 70 miles into an unmarked valley and were greeted with this view. Smoke billows from the Whittier Fire in Northern Santa Barbara County. The smoke obscured the sun and provided dramatic lighting in the Santa Ynez Valley below. Taken from the Riviera section of Santa Barbara, overlooking the harbor. Happy 4th of July! 2000+ year old petroglyphs of the Kumeyaay Indians are illuminated by a digital sunset (read the light of a smartphone photo). 26 minute exposure. Little Blair Valley. Stones stand unperturbed in the Northern California surf, Mendocino County. A young surfer checks the waves during a winter swell at the famous Sandspit surf break. Arriving just in time for the spectacular superbloom of 2017. The actual park facility was overrun with tourists, so I decided to explore and found this solitary mountainside all for myself. A large wildfire engulfs the backcountry of Santa Barbara County. Thankfully, property damage and injuries were kept at a minimum thanks to the efforts of firefighters. An aerial panorama showcases the brilliant wildflower superbloom of 2017. Carrizo Plains National Monument, San Luis Obispo County. A couple bathed in the Southern California Moonlight, Ledbetter Beach, Santa Barbara. The famous vista in Death Valley. Atop the 7,000 ft. peak, one can gaze down 7,220 feet to the lowest point in the United States, Badwater. A hiker is framed by clouds in Death Valley. An ageing laundry facility and vehicle sit languidly in the desert of Tecopa, near the entrance to Death Valley. Temperatures here in the summer routinely exceed 120 F (49 C). Looking Westward towards California's Central Coast. Taken from La Cumbre Peak, Santa Barbara. Santa Barbara's famous dolphin statue framed under moonlight. The statue has run dry the past years due to the extreme drought conditions. Monarchs nest for the season on the Central Coast. During peak months, tens of thousands of the butterflies can be seen at this location. A tableau-vivant recreating a famous painting during Santa Barbara's annual Fiesta celebration. A Joshua Tree in the park after which it is named is framed by the clear night sky. Orion can be seen above the tree. A boulder in Joshua Tree National Park is split cleanly by forces unknown. The hot midday sun forces it's way through the crack. A yucca tree stands tall during a beautiful sunset in the Los Padres National Forest. A traveler embraces the sun at historic Knapps Castle. The large mansion was built in the 1920's and was sadly consumed by a wildfire less than a decade later. Only the sandstone frame remains. A fire created by LED lights and a long exposure ignites the ageing fireplace of Knapps Castle in the mountains near Santa Ynez. Sunset frames a grove of walnut trees near Lompoc on the Central Coast. The Moon rises above the Joshua Trees during a clear nigt in Joshua Tree National park. A close friend during a long photographic journey into remote areas of the Mojave Desert. 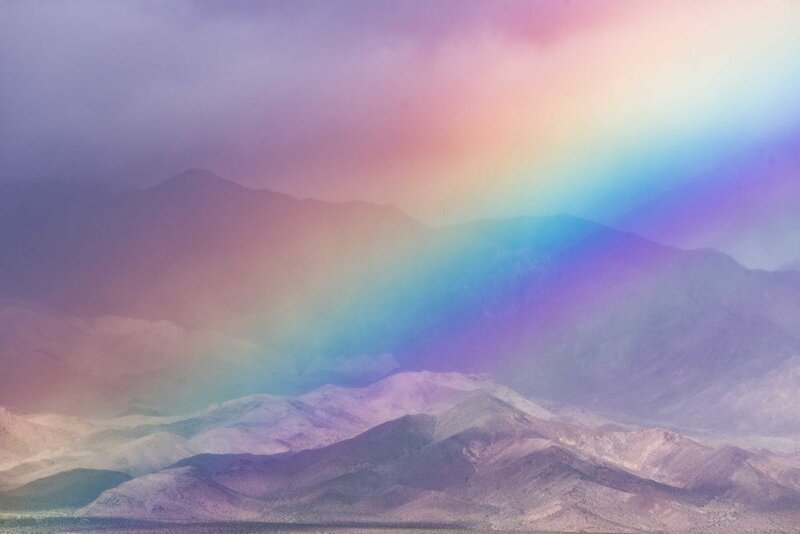 A rare rainstorm creates a vivid rainbow over the mountains near Death Valley National Park. Brilliant orange California Poppies, the state flower, bloom on a ridge in the Los Padres National Forest. A morning storm creates a rainbow behind the countless windmills in the small town of Mojave. A brave Monarch butterfly alights on the photographers hand in the monarch grove of Elwood. The wealthy enclave of Montecito is illuminated by a full moon. A street performer in Santa Barbara is backlit by an orange sunset. Taken at the end of a long photographic road trip, the road back to the photographer's hometown of Santa Barbara is lit by a passing vehicle. 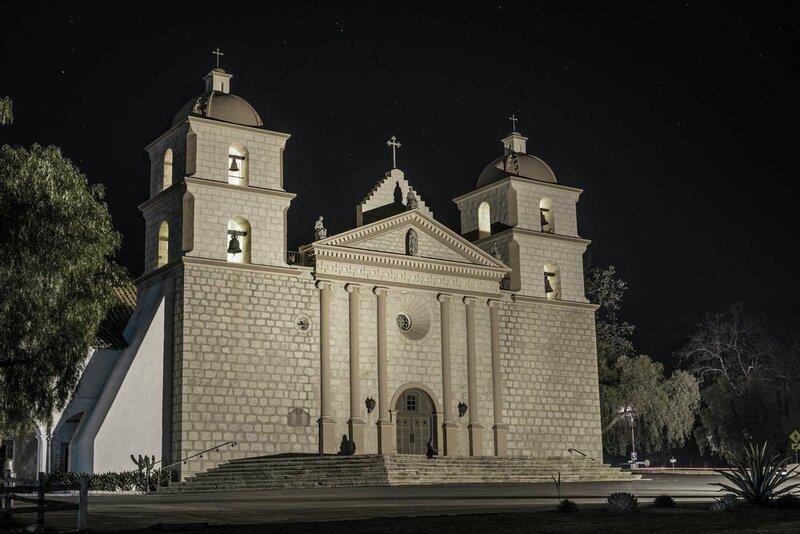 The famous Mission building in Santa Barbara on a clear night. One of the 21 Catholic mission buildings of California. Winter storms created a temporary watershed in the desert of Tecopa. The city lights of Santa Barbara create strong lines on the waters of the Pacific. A blanket of fog envelops the Santa Ynez Valley on a summer morning. The area pictured was consumed by a wildfire later that year. Often, travel to a destination allows for more impressive images than the destination itself. A 26 image mosaic captures sunrise over the Santa Ynez Valley. Taken at an extreme focal distance of 500mm, the tourist wharf of Santa Barbara is shown in a new perspective.